The Baule of modern day Ivory Coast perform a number of dances for village entertainment; one such performance is known as Mblo. Mblo is performed during times of stress, social anxiety, or political reversals, to bring relief and entertainment to the community. Mblo performances also take place during funerals of high ranking and respected community members—in this case funeral performances are called Gbagba. Mblo performers wear costumes that include portrait and animal face masks (these masks are also called Mblo), and their dances mimic the behaviour of the character their costumes portray. The performances increase in intensity as a succession of masqueraders enter the village square wearing masks that represent, pay tribute, caricature, and criticise important members of the community. The climax to Mblo performances occurs when the final mask, representing the most revered member of the village, appears. Typically commissioned by men to honour female relatives, Mblo masks are said to be the 'artistic double' of the person represented. 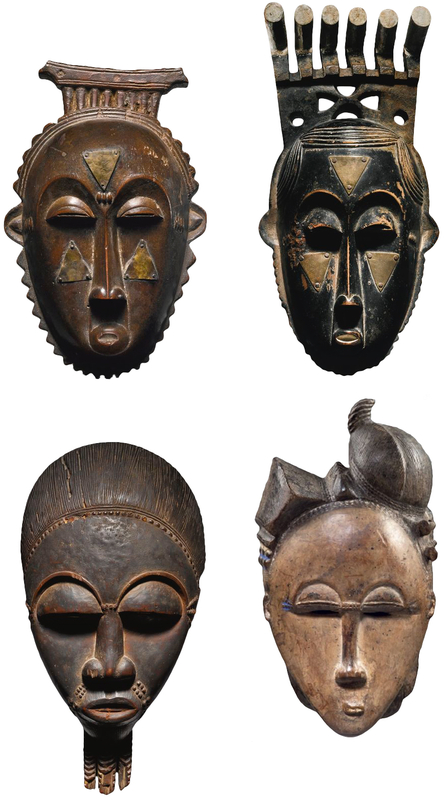 As such, human masks carved in the artistic image of a female are called ndoma, meaning 'namesake'. Ndoma masks usually bear the name of the person represented and during performances, that person is required to be present when her mask appears. When not in use, Mblo masks are kept in the bedroom of their respective masqueraders, carefully wrapped in cotton cloth to prevent women from seeing the back of the masks and to protect the mask from insects.